A group of local residents, led by actor Shane Withington, established the Friends of Currawong to lobby for its protection. Currawong was bought by the State Government in 2011 who announced the creation of Currawong State Park in 2015. 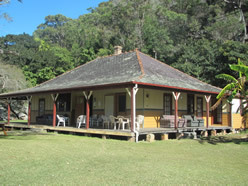 “Midholme”, the original Currawong homestead built in 1911, was restored in 2014, and in September 2017, the NSW Government announced a $1 million grant for the restoration and modernisation of the remaining 1950s-era cottages. Midholme restored thanks to major Friends of Currawong donation. The main homestead on Currawong has undergone substantial conservation work thanks to the generous donation by the late Don Seaton who had been a long time member and supporter of Friends of Currawong. Don Seaton’s donation of more than one million dollars provided the funds necessary to restore MIdholme, the original homestead. Friends of Currawong have worked with Pittwater Council to enable the historic building to be returned to its original heritage role as the centrepiece of Currawong. PittwaterCouncil, conscious of the heritage value of Midholme, employed skilled conservation tradesmen to carry out the extensive work that was required. The original slate roof has been replaced with slate imported from Wales and the sandstone piers and verandah have all been extensively repaired. All the interior has been refurbished including a new kitchen and bathrooms. Friends of Currawong President, Shane Withington, said “Don loved Currawong and he would have been so proud to see what has been achieved”.